It was British Prime Minister Harold Wilson who first said ‘a week is a long time in politics’. Almost sixty years later, his words have proved as sage now as then. Had Harold Wilson been a keen gardener, and I can find no evidence that he was, he would have found gardening no less of a roller-coaster ride. One minute there’s nothing doing, all quiet on the Western Front, and in a trice it’s actions stations, curtains up, tah-dah time. Despite every disadvantage my spring bulb theatre is going to put on a show-stopping performance, bang on cue for the Bank Holiday. 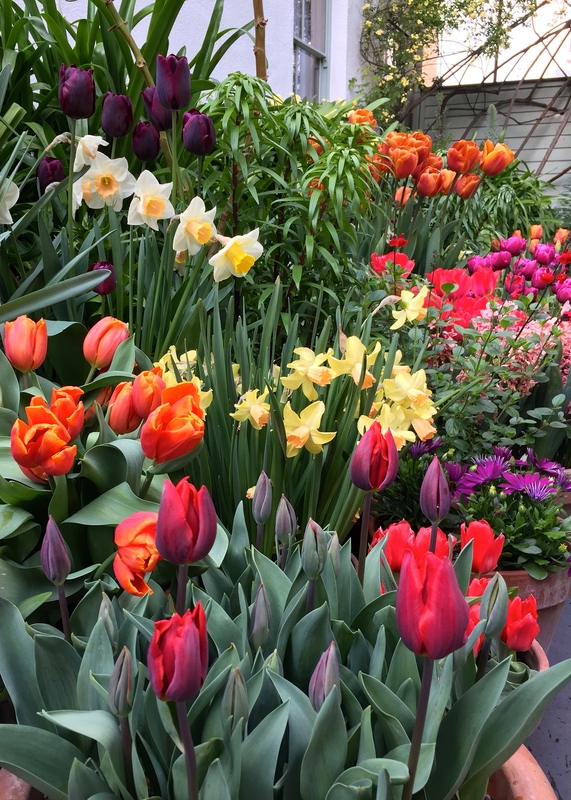 An all-star cast of tulips, hyacinths and daffodils, supported by a cheerful chorus of osteospermums, is about to hit all the right notes. I am quite astonished that it’s all come together after a lot of sub text-book gardening practices were employed, but that’s bulbs for you: they have a knack of compensating for human incompetence and the vagaries of the weather. The tulip I am most enamoured of this season is called ‘Lasting Love’. It has oxblood-red, chalice-shaped flowers. The petals have a lustrous quality which makes them come alive in the sunshine, bringing out the richness of the red. The foliage, not usually worth writing home about when it comes to tulips, is attractively wavy. I have positioned ‘Lasting Love’ next to Euphorbia ‘Blackbrid’ – a match made in heaven. 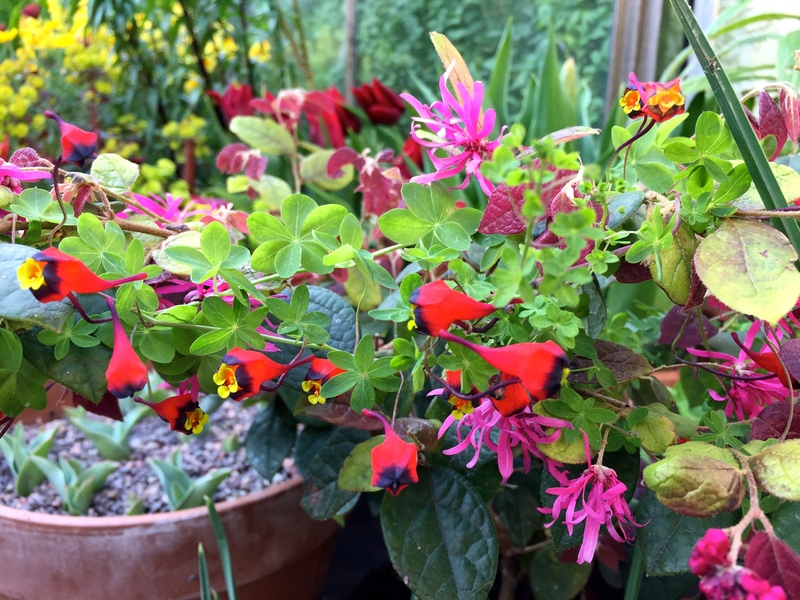 Next door, a partnership fashioned somewhere vastly less salubrious is Tropaeolum tricolor with Loropetalum ‘Ming Dynasty’. Please believe me when I tell you that this unfortunate coupling was not planned, but now it’s happened I don’t have the heart to tear them apart. 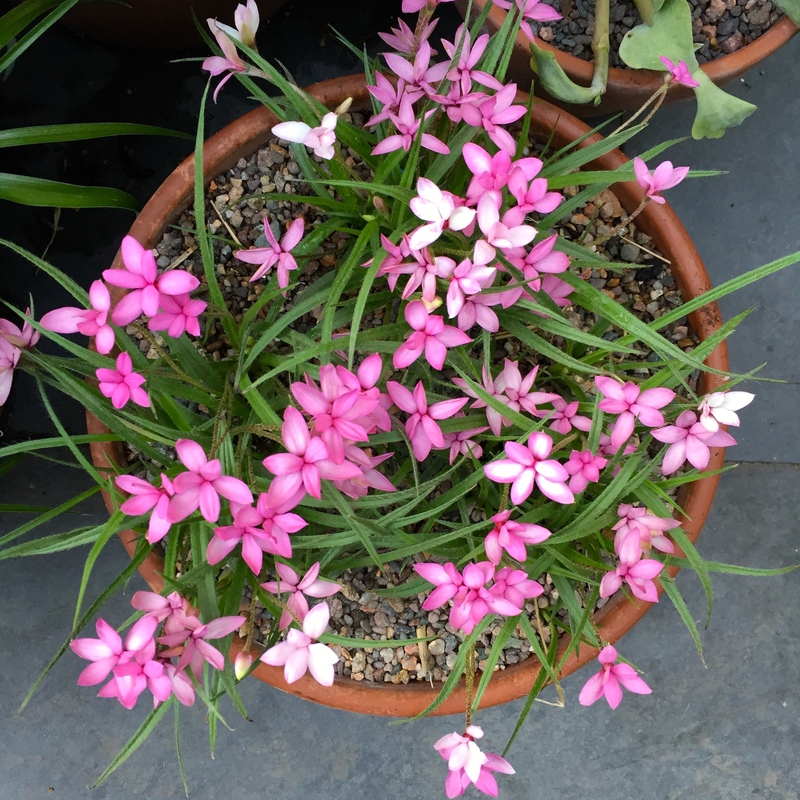 Last weekend, Martin The Garden Centre Man tempted me by waggling a new delivery of pale pink rhodohypoxis under my nose. Overlooking the lurid pink pots in which the nursery had supplied them, I could see their potential as subjects for a shallow bowl and purchased three potfulls. Having not grown these diminutive South African bulbs before I quickly researched and found out they favoured a moist, acidic, gritty compost. They are possibly a little too particular in their tastes to live for long in my care, but I am excited to see how I get on. Given a choice of unpredictable occupations, I’d choose gardening over politics any time. 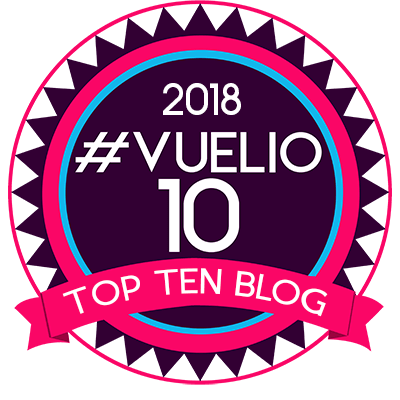 It’s taken me a week to write this post, in which time the general election has gathered pace, there has been another terrorist arrested in London and the pound has finally started to rally against the dollar. Meanwhile, in the garden, hostas have unfurled, pleiones have bloomed and pak choi has been planted in the vegetable garden. Weeks like that can last as long as they like. What can I say? FABULOUS!! I’ll definitely skip talking politics, but a week in gardening does certainly bring about a lot of changes. In your case, a wide range of beautiful blooms abound. In my case, a wide range of plants are poking through the ground. But, I’ll take either case over the the other subject. 🙂 Your garden looks outstanding. Glorious. It seems as if it’s never too late to plant spring bulbs, after all! You mentioned a week being a long time – it always amazes me that you don’t have to drive too far south at this time of the year to find that the hedgerows and gardens are a week further on. That’s true. Although it has been bitterly cold in London and the South East in April, and that’s put a lot on hold. I did plant some spring bulbs in March as an experiment, just to see how far one can push it. They are just coming through. Results to follow in a future post. Have a lovely weekend. Fantastic pots Dan, just as mine are all finishing. Putting “Lasting Love” on my list for next year. Only” Barcelona” and “Mention” blooming now. Please don’t tell me that is geranium “Maderense” up against the far wall – it must have over wintered in the cold green house, even in your protected seaside garden. What are you going to surprise us with for the summer display? Keep the posts coming. Mrs. P.
Yes, that’s Geranium Maderense Mrs P. I have four whoppers – one white, three pink – all flowering right now. They have lived their entire lives outside in the garden. They are the best ‘crop’ I’ve achieved in about 6 or 7 years though. Not a blemish on them. They will keep me going over the next few weeks ….. and the bees LOVE them. Even spotted a tiny blue butterfly last weekend. That’s quite a combination Sally. I bet the two look dazzling together. My first time growing this tulip …. but it won’t be the last. Sooo beautiful Dan. I haven’t spotted the “warty” tulip (tulipa Rococco) from last year in your bulb theater. I love lasting love, just stunning. You are too kind! They are modest compared to GD, but always good to have something or someone to aspire to. 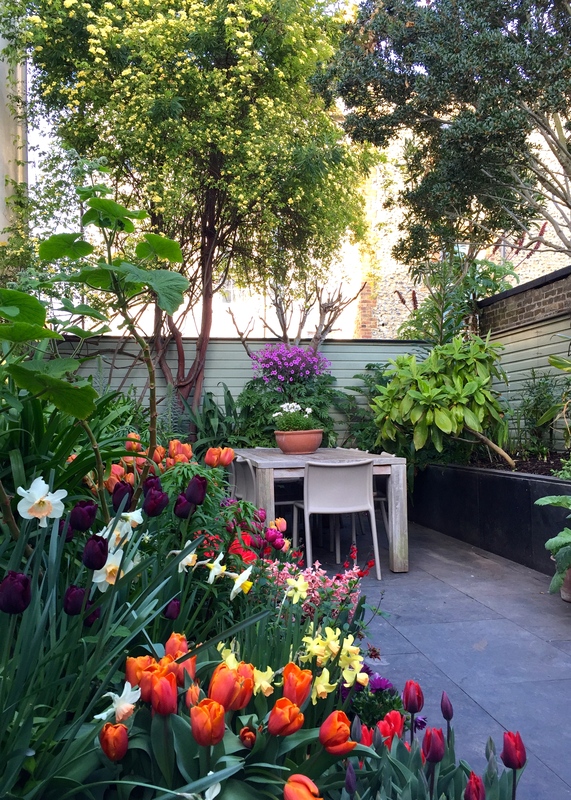 I am happier with the mix of plants this year – that is, they are not all bulbs. In my B list area there are some very interesting combinations which I might have to promote to the A list space next year. I’ll take some better photographs this weekend. Hope you are not exhausting yourself in China? Looks so much like Spring time from your photograph. Enjoy the long weekend with the flowers and plants. Just oh so fabulous – have taken note of the mentioned tulips!!!!! I’ll be putting together a list of my favourites over the next few days, so keep an eye out for those Sally. Have a great weekend. Just glorious! Lasting love has been added to my list for next year. My pots went past their best a couple of weeks ago so there is something to be said for delayed planting. It seems to me that this has been quite a long spring with trees in the woods behind our house still nowhere near fully out. But I have been driving more slowly on my fortnightly commute from Gloucestershire to London (granny duties!) to be able to enjoy the countryside, full of blossom and a thousand shades of green. Even the M4 is quite delightful at this time of year! And I have found that traffic delays have their compensations, one forced halt enabled me to enjoy looking at a roadside display of wood anemones and the first cowslips which I would not have otherwise noticed. Gorgeous display Dan, mouthwatering in fact! Oh what an impressive and fabulous display! All my spring bulbs are over now leaving lots of leaves and stems and no colour :-(. I am with you with gardening over politics – I’ve banned it on my Twitter feed! Home…. no more traffic jams…. bad air …. and queues! Yippee and only 22 sleeps till Chelsea…..
Gosh, that’s not far off is it? I will drop you an e-mail this week regarding arrangements. Hope you are not straight back into the office? Fantastic post thank you so much for your inspiration !